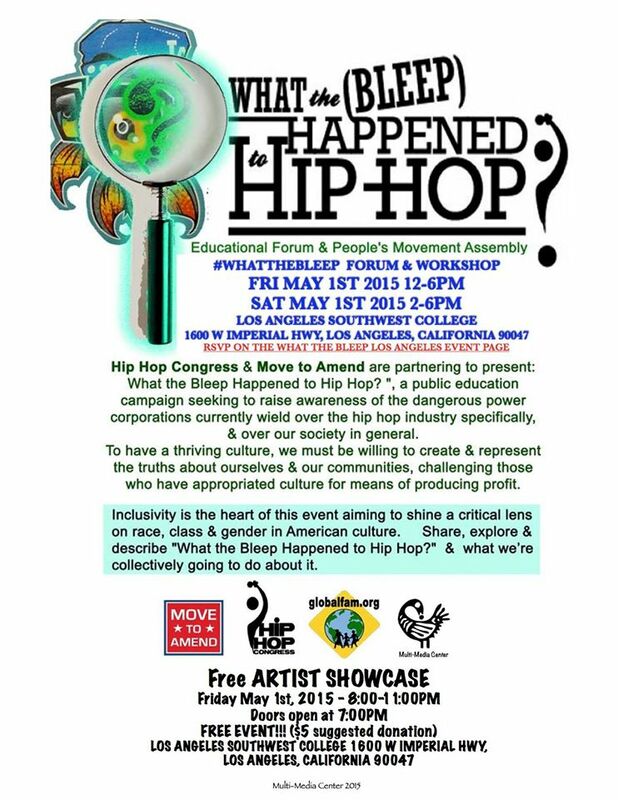 Hip Hop Congress and Move to Amend and are partnering to present: “What the Bleep Happened to Hip Hop?”, a public education campaign seeking to raise awareness of the dangerous power corporations currently wield over the hip hop industry specifically, and over our society in general. We invite you to join us on May 1st and 2nd, 2015 when this unique collaboration arrives in Los Angeles, CA. During the day on May 1st, 2015, we will have educational panels and participatory conversations, followed by an artist showcase that night. We will close with a People’s Movement Assembly on Sunday that connects to the United States Social Forum. The GCC’s own Timeka Drew will be representing the Convergence on the Local Panel May 1. Get more information about this event at the GCC Event Page. Previous Post: Celebrate Earth Day with Cheri Honkala in Santa Barbara!